There are continued rumblings in the Portland-Vancouver metropolitan area about reviving the abandoned plan to spend $3 billion or more on a grand Columbia River Crossing to replace the existing 6-lane Interstate 5 freeway bridge with a 12-lane structure and a short light rail extension. 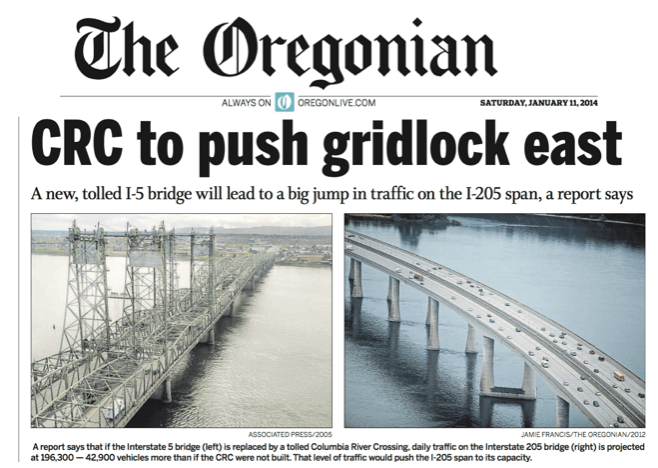 The project foundered almost five years ago over disagreements between Oregon and Washington about who would pay for the bridge. The bridge is the site of daily traffic jams, as thousands of people who work and shop in Oregon but live north of the Columbia River all crowd on one of the two interstate freeway bridges that connect the two states. The sentiment in Washington State is that the capacity of the freeway should be expanded; Oregonians, who have built an 60 mile long light rail system, have argued that any new bridge should connect Vancouver Washington to that system. 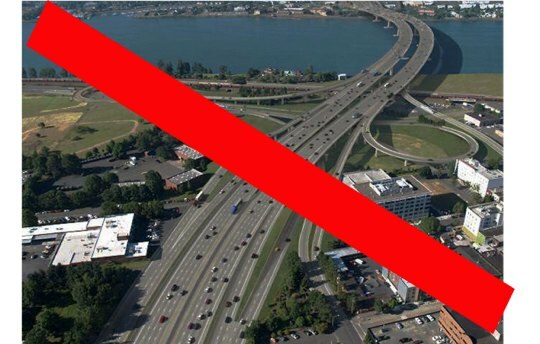 Oregonians, it must say, are skeptical of the value of new freeways; many Washington residents are vehemently opposed to light rail (regularly labeled “crime rail”), and also aren’t interested in paying tolls to cross the river. The original project was a compromise between the two states that on paper gave both sides some of what they wanted: a light rail extension for Oregon, a doubling of freeway lanes for Washington. No one ever bothered to ask why one would massively increase freeway capacity in a corridor in which one was also making a big investment in light rail: building one tends to undercut the rationale for spending money on the other. The project, led by the Oregon and Washington Departments of Transportation bumbled and bungled through a planning process that cost nearly $200 million and took seven years. Just one example: The project suffered a year of delay because the bridge had to be re-designed for a higher navigation clearance, something highway engineers had been told for years, but had ignored. Ultimately the two state DOT’s produced a project that had serious financial holes, and which would, as proposed have been a major transportation disaster: the project’s own studies showed that tolling the new bridge while leaving a parallel existing bridge untolled would produce gridlock while leaving the new bridge vastly under-used. In the past couple of months, a few local groups have been agitating to revive the project in some form. A special committee of the Washington Legislature held a meeting, across the river in Portland to discuss the the project, in December. A number of Oregon legislators–all veterans of a difficult and ultimately unsuccessful attempt to build the bridge–were their guests. The upshot of the meeting: No one is satisfied with the status quo, but there’s an utter dearth of agreement on what the two states might do. Into that vacuum has stepped Washington Governor Jay Inslee, who broadly endorsed a possible revival of the project in his newly proposed budget. It sets aside $17.5 million (a pittance, actually) for some planning. But Inslee–who is burnishing his environmental credentials, as part of a rumored Presidential run–in insisting that the project include light rail. That’s a non-starter for a big share of the population in Vancouver, Washington, and especially the area’s Republic lawmakers, who immediately told Inslee that, as it was five year ago, the inclusion of light rail is a deal-killer today: Those who don’t learn from history are doomed to repeat it, they warned. If Oregon representatives insist on light rail, perhaps Washington negotiators can strike a deal. Bring light rail into Clark County in exchange for firm deals on a third and fourth Columbia River crossing, for vast improvements to the Rose Quarter corridor through Portland, and for an agreement that Oregon will drop plans for tolls on Interstate 5 and Interstate 205 near the state line. Let’s tote that up for those of you who haven’t seen the price tags for all these ideas: the calls for “third and fourth” bridges across the Columbia would require expenditures of something on the order of $500 million each (without allowing for any actual roads to serve such bridges). There are already $500 million in lane widenings proposed for the Rose Quarter freeways; apparently the Columbia wants even more. And tolling was the essential financial cornerstone of the original CRC project; and that was when the two states expected billions in support from a federal government that shows no signs of providing such funding for the project today. Within inflation, and cost overruns, this probably works out to $5-6 billion in projects fo which neither state currently has any budgeted resources. In short, the editors of the Columbian are delusional if they think that Oregon’s desire to see light rail go to Washington, extends not just to taxing its citizens to pay for this project, but also subsidizing two more bridges, widening Oregon freeways and giving Clark County residents a pass on paying any of the cost of these projects via tolls. If anything, in the wake of the failure of the original CRC proposal, the two sides have become even more locked in to their mutually incompatible positions. There’s essentially zero basis for agreement between the two states on the proposal. The original project was a tenuous and unstable compromise that tried to paper over fundamental disagreements. As it turns out, the real gridlock between Oregon and Washington isn’t on the I-5 freeway; it’s the irreconcilable differences within the region about the future of transportation. As a result, the revived Columbia River Crossing is going . . . nowhere. Editor’s note: For seven years, Joe Cortright worked as an advocate with community groups opposing the Columbia River Crossing. For some of that time, he was compensated for his professional services.